It had been 40 days since he applied for his visa, and Abdul Wali Modaqiq (right), the deputy director general of Afghanistan’s National Environmental Protection Agency, had not heard a peep from the U.S. embassy in Kabul. 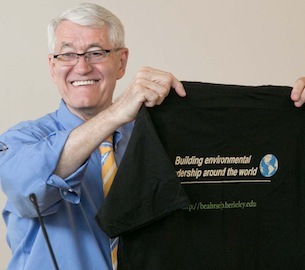 The Beahrs Environmental Leadership Program (ELP) at UC Berkeley was starting in just days but, despite having a diplomatic passport and a government-sanctioned mission to attend the program, he and his Asia Foundation sponsors didn’t know if they were stuck in a bureaucratic snafu or a silent political standoff. Time was running out, and Modaqiq, a seasoned government official who earlier this year already had traveled to Stanford University for a preparatory workshop related to the Rio+20 sustainable development conference, and was accustomed to waiting less than two weeks for a visa, was getting anxious. 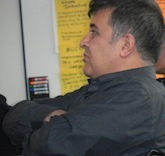 He had hoped to work with leading experts and international colleagues on writing and implementing policy during his two weeks at the ELP, a summer institute that selects leading practitioners from around the world to gather at Berkeley’s College of Natural Resources, where they study with renowned environmental and agricultural faculty, collaborate with colleagues from around the world, and make new connections. Then on Thursday afternoon, just as the Afghan weekend was getting underway and Chancellor Birgeneau was addressing the freshly arrived ELP fellows at the program’s welcome ceremony on campus, Modaqiq, who had abandoned hopes for attending, received a call: his visa was waiting for him at the embassy. Hasty preparations, a flight from Kabul, a 10-hour layover in Dubai, two hours sitting on the tarmac because of a sick passenger, and 16 hours in the air brought Modaqiq to San Francisco at 4 p.m. Sunday; he was at a 5:30 session that night. In contrast to that dramatic entrance, when you ask ELP students why they traveled to UC Berkeley from developing countries around the world, workaday business terms like networking, negotiation skills, conflict resolution, and best practices come up again and again. That’s because ELP participants are not starry-eyed idealists but highly accomplished professionals working, sleeves rolled up, on real problems of developing countries every day–problems that demonstrate at once the grand scale of the global issues at hand, and how much diverse and far-flung countries have in common with each other. But the challenges of managing protected areas are as nuanced as Africa is large. Andriamandimbisoa (Dimby) Razafimpahanana of Madagascar (above; photo: Jim Block), who works with professor Claire Kremen on the Madagascar Biodiversity Network, a joint project of the Wildlife Conservation Society (WCS) and UC Berkeley, is here to learn more about how to identify the best places to locate protected areas. 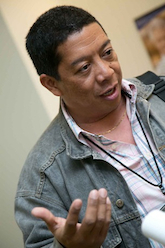 He also leads a technical group and is working on a portal to share biodiversity data across Madagascar. Simon Akwetaireho of the Jane Goodall Insitute in Uganda, is hoping to take home the latest expertise to enhance his work on a three-year collaboration with over 1,500 forest owners and 8 conservation organizations to conserve forest biodiversity on private lands. 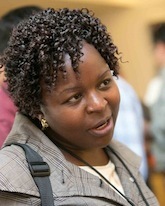 Gladys Zacharia Ng’umbi (left; photo Jim Block), the park ecologist for Arusha National Park in Tanzania, looked weary from her long journey, but also from the management struggles she easily ticked off–killing wildlife, cutting firewood and medicinal plants, unsustainable water extraction from key watersheds …. She is looking to improve her skills for working with communities to meet their needs in ways that are sustainable for both the people and the parks. Issues at this year’s ELP extend far beyond parks management. Mesfin Kassa Admassie, who works for a large population, health, and environment consortium in Ethopia, and Angelina Davydova, a journalist and university professor from St. Petersburg, Russia, both work closely with environmental journalists, training them on scientific issues and working with the media to influence policy makers and educate the public. Amleset Haile Abreha of Ethiopia, is assistant national coordinator of a five-year, seven-university agricultural growth program to help Ethiopian farmers increase food production in ways that also conserve natural resources and ecosystem services. Vuthy Ly, deputy director of Cambodia’s Community Fisheries Development Department, says his government is shifting from large-scale to community-based fisheries in an effort to make the country’s all-important fishing industry more sustainable. But the switch creates yet-to-be-defined roles for everyone involved in the industry, and the policy does not directly address ongoing problems such as illegal conversion of forests. Kelzang Wangchuck, (right) park manager of Jigme Singye Wangchuck National Park in central Bhutan, says unlike countries with deforestation issues, 51 percent of Bhutan is protected area and environmental protection is the government’s largest department. “But employees are mainly field workers, like rangers–not scientists,” he says. “We have many rare animals that are going extinct, like white-bellied heron–there are only 200 left in the world.” Bhutan’s few small colleges lack expertise in areas like conservation biology and human-wildlife conflict, so they have no one to organize research and conservation efforts, Wangchuck says. In addition to bringing home new information, he’s hoping to connect with Berkeley scientists who can get research funding to partner with him. “If they can come to Bhutan, I can provide people to assist them with the research and guide them through the land,” he said. The World Wildlife Fund organization of Bhutan and Great Britain supported his trip, along with ELP donors. 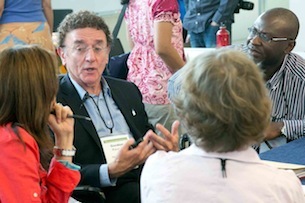 UC Berkeley agricultural and resource economics professor Gordon Rausser (left) talks with newly arrived ELP students. Despite his visa ordeal, hurried travel, and the enormous responsibilities waiting for him back in Kabul, Modaqiq said he is thrilled to be here. “For the first time in my life, a person from Afghanistan is taking part in a program like this, talking about the environment,” he says, emotion creeping into his diplomatic demeanor. “People may have be thinking, Afghanistan has an environmental agency? Afghanistan has an environment?” He’s here to say it does, and he’s been working on it for seven years. “After the fall of the Taliban, the government established the first agency responsible for the environment in the history of the country. Since 2005, the National Environmental Protection Agency, or NEPA, has been dealing with how to address the challenges inside the country. "We have environmental problem such as urban pollution, land degradation, cutting of forests, and conflicts on access to natural resources in the country and NEPA's role is to develop policies and regulatory frameworks to deal with those issues and improve the environment for the existing and future generations," Modaqiq said.